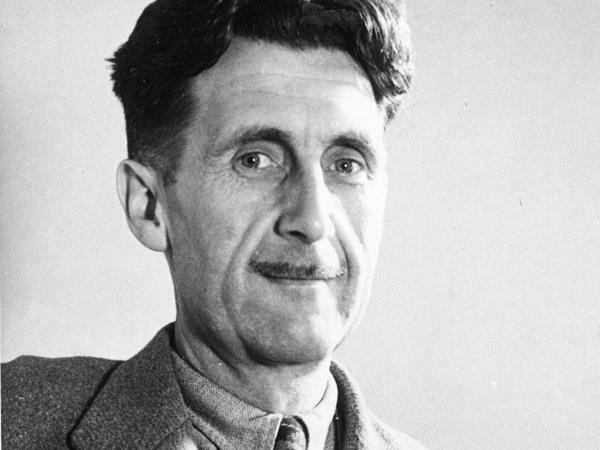 Writer George Orwell, author of the novel 1984, which portrays a dictatorship that imposes its own facts. The Amazon best seller list is updated hourly so it can swiftly track a surge in a book's popularity. A spokesman for Signet Classics which currently publishes 1984 said sales have increased almost 10,000 percent since the inauguration and moved noticeably upwards on Sunday. That's when Counselor to the President Kellyanne Conway appeared on Meet the Press. When host Chuck Todd challenged the Trump administration's assertions about the size of the Inauguration Day crowd, Conway responded by saying that the administration had " alternative facts." That phrase drew a lot of attention. On CNN's Reliable Sources, Washington Post reporter Karen Tumulty said "alternative facts" was a " George Orwell phrase." Expanding on that idea in an interview today Tumulty said it reminded her of the double speak found in 1984 where "war is peace, freedom is slavery, ignorance is strength." CNN tweeted Tumulty's remark which contributed to the surge in book sales. Eventually other journalists also made the connection and the story took on a life of its own. As the story took off so did sales of 1984. Earlier this week Signet Classics ordered a 75,000-copy reprint of the book and the company spokesman says there could be more printings in the near future.